Yes! I'm ready to be a teacher! Are you ready to finally step into your power and help others? Yoga Teacher Training by the Yoga Goddess Academy. 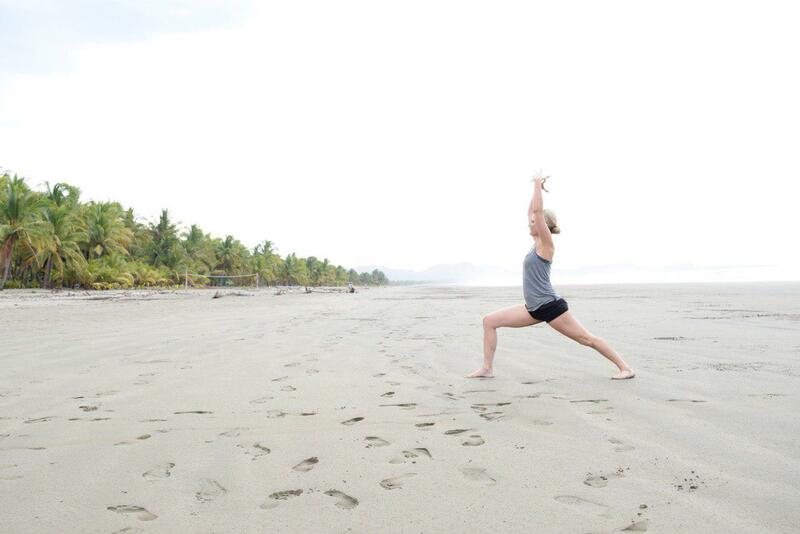 Learn how to be a yoga teacher over 12 days in beautiful Costa Rica! You’ll become a certified yoga teacher and your certification is eligible for Yoga Alliance registration. When you teach yoga, you’ll be making a difference in people’s lives which will give your life even more meaning. After you finish our 12 day intensive in Costa Rica, you’ll have continued email support for 5 months as well as having access to all recorded modules online forever! I already know I want to join! Jump to pricing. Sound familiar? Then this training is for you! Want to do more than just teach a couple classes a week at a local yoga studio. 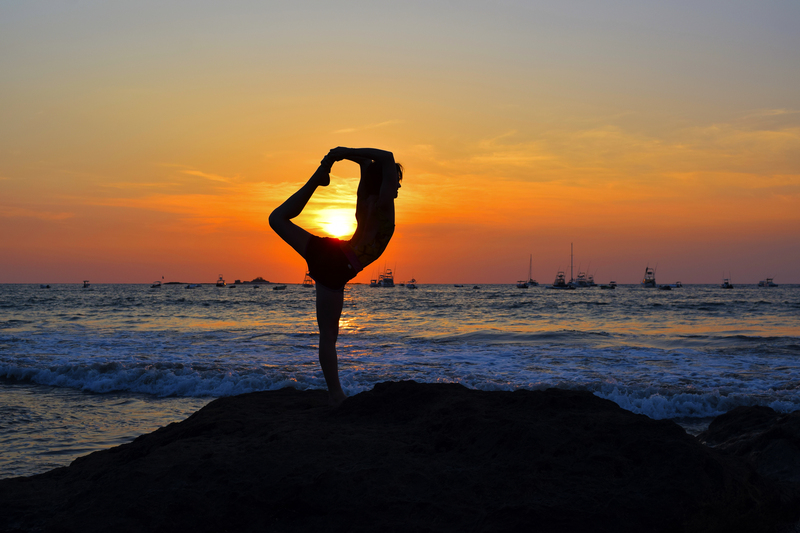 Want a yoga teacher training certification to be a stepping stone to something more. You have dreams of teaching 1:1, being a coach, having online offerings or leading retreats. Have completed a 200 hour YTT but don’t feel it provided sufficient training in sequencing, class planning, alignment, cueing, or enough to help you become a confident teacher. Want to plan a great class but also create space for deep personal growth for clients. You will have a thorough understanding of more than just the physical practice. You will learn how to weave together everything you learn into something that makes sense in you mind and is unique to you so you can go out and teach with a fresh perspective. This program will help you to stand out from the sea of other yoga teachers by teaching you to proficiently sequence, plan, and teach students of all levels and body types. Our last training in Costa Rica. Hi! I’m Crystal, creator of Intuitive Flow Yoga. So many women come out of yoga teacher trainings feeling like they aren’t ready or aren’t good enough to teach. They lack confidence and some of the basic skills that are pillars of a quality training. I want to help you find your unique style so you can learn teach in a way that is authentic to YOU. 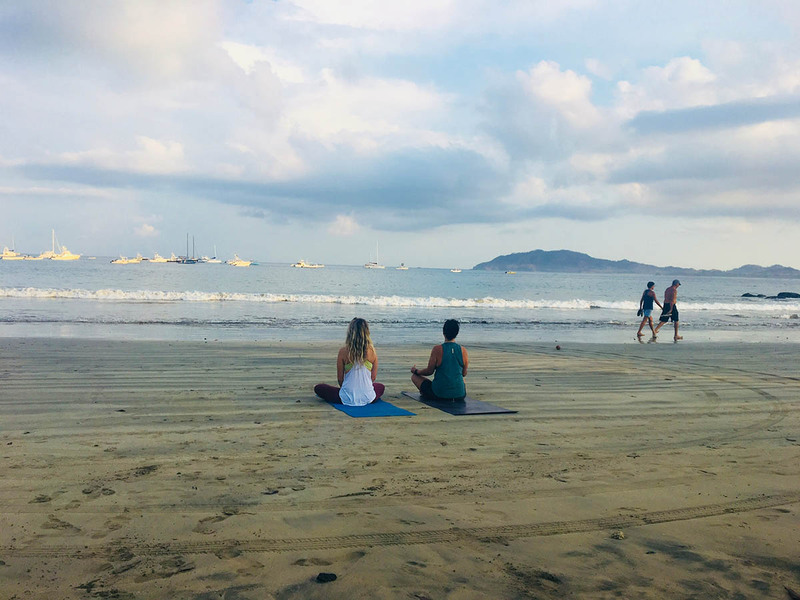 A yoga teacher training can, of course, help you to gain the knowledge and skills to teach effective and inspirational yoga classes but it can also help you to really commit and be held accountable to your spiritual and yoga practice. By committing to a training, you are committing to not only practicing teaching others but practicing yourself as you can’t teach as authentically if you’re not doing the work. I have brought together a program that will help you become a confident and intuitive yoga instructor. Each module will build upon the last and, when combined with the videos, will bring a thorough understanding of the subject matter. By this time next year, this could be you! I’m so incredibly grateful for Crystal and her following her calling of leading YTT. Though I’ve already taken 200hrs of training about 7yrs ago now, I’ve learnt so much more this time around and that’s all thanks to Crystal. She is thorough and extremely wise and knowledgeable in her teaching and how she teaches future yoga teachers. She covers different yoga styles, assists, breathing ques, chakra balancing, madras, meditations, and so much more. She also sees our strengths and works with them in teaching us the types of classes that we would excel at teaching. On top of all I’ve learnt I can also say that Crystal is such a beautiful person inside and out and is Always there to continue helping me and her other goddess students excel at their love for teaching yoga. She is and amazing and genuine person that I am so blessed to be able to call my goddess sister. 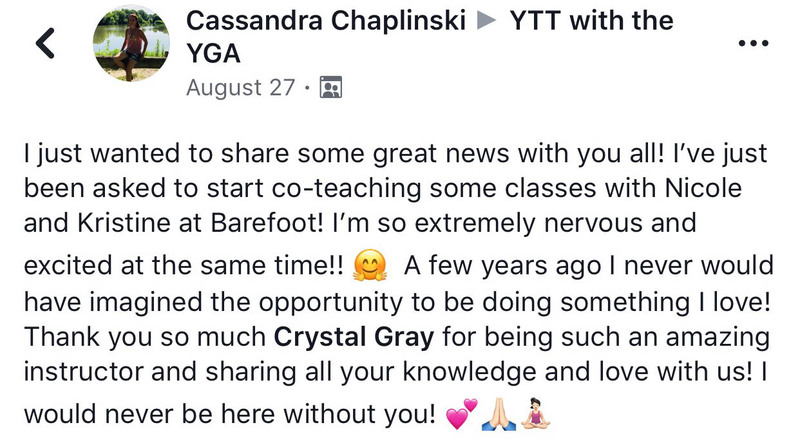 I will hands down recommend learning from Crystal whether it be taking her yoga classes or her YTT course. 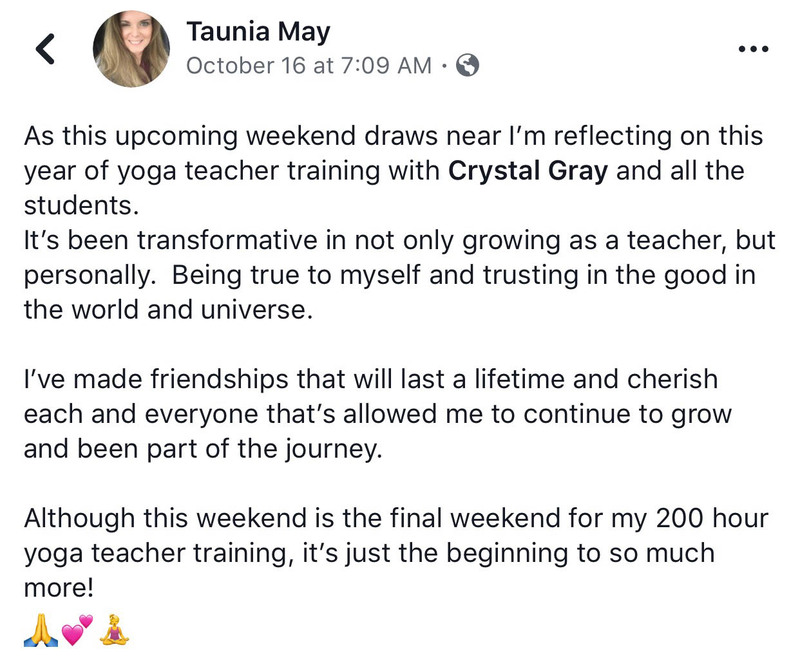 I’m so excited for my renewed journey of teaching yoga with my new goddess tribe behind me, and I cant wait to continue my training for my 500hr with Crystal in the future. 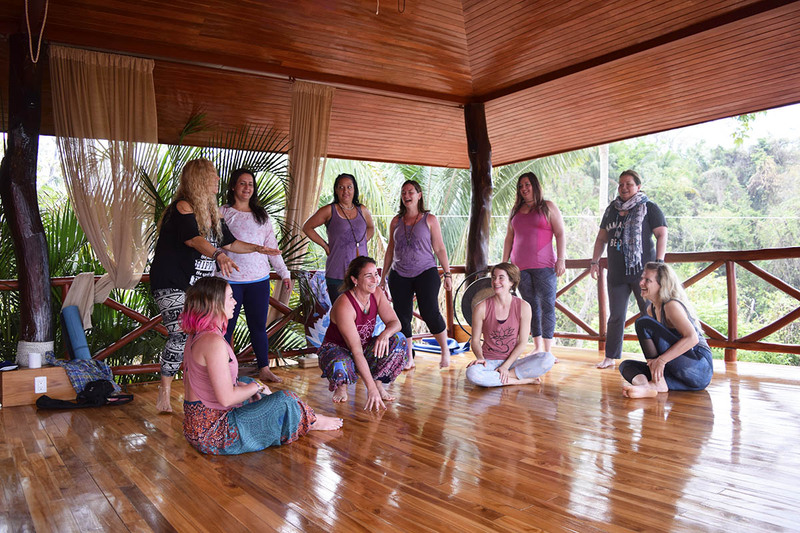 This group intensive Yoga Teacher Training in Costa Rica is designed to give you enough 1:1 attention and empower you to teach confidently. Learn how to tap into your inner Guru by accessing your Intuition so that you can not only deepen your own practice but help others to do the same. Discover how to be a guide for your students and teach them how to tap in to themselves and find their inner Guru as well. Empower students by giving them the tools they need to enrich their lives through yoga, meditation, breath practices and much more! 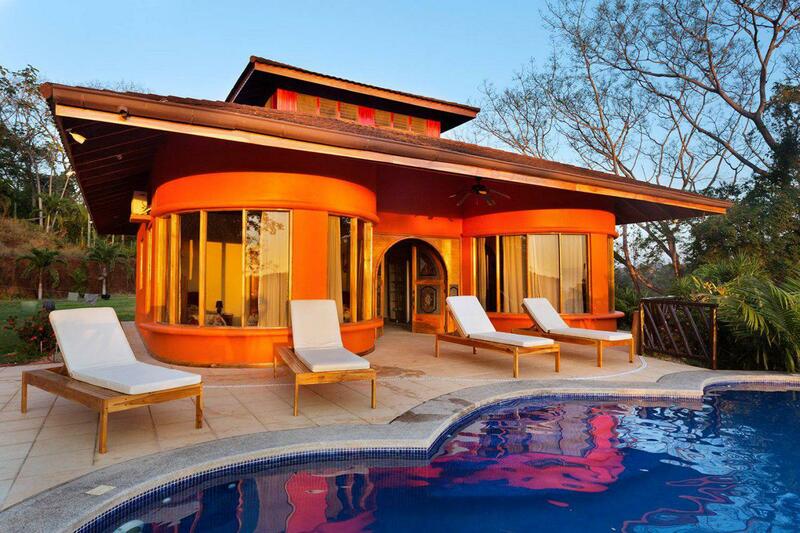 Explore what it’s like living a yogic lifestyle in this secluded yet modern gem just minutes from the beach. 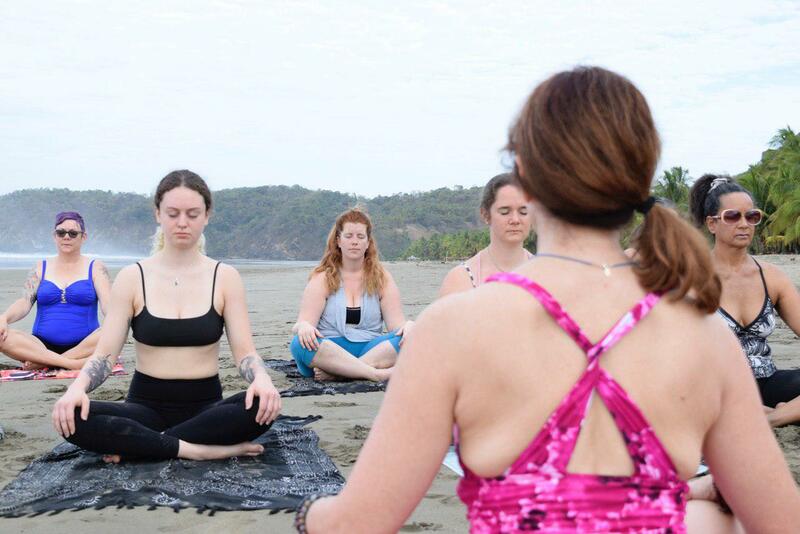 Listen to howler monkeys and watch the waves crash to the shore from our private yoga shala nestled in the mountains! Playa Bejuco is less than an hour away from the quaint town of Samara on the Nicoya Peninsula in the Guanacaste region. We’ll be visiting the quaint town of Samara once during the training. There are restaurants along a beautiful beach, horses meandering on the shore and, while there are a lot of expat-looking people, surprisingly, not a lot of people trying to get you to buy things, which is different than a lot of the other more populated towns. Playa Bejuco beach is known for being off the beaten path and a hidden gem on the coast. It’s perfect to learn how to boogie board and is only a short ten minute drive from our retreat center. The retreat center is nestled in the hills above the ocean with views of the beach and jungle. It’s far enough away from everything to feel relaxed and focused yet close enough to activities to have the opportunity for adventure. There are a couple single occupancy rooms but most are double or triple. Please message us if you would like to try to work out a single occupancy room though the price will increase to $4950. All modules in your own private membership area that you can access anywhere and anytime (even from the road). Access to Crystal after the training for support and guidance. A beautifully designed yoga teacher training manual that you can keep for life and continue to use in your own practice and to grow as a teacher. Watch Module 1 of our training for free! Years ago when I first stepped into a yoga class, I finally felt at home. Something clicked. I knew that this was my next step along my path. For years I had struggled with not knowing where to go in life as well as where to go spirituality. This, I believe, resulted in years of addiction and treating my body terribly because I was so disconnected. I knew I had this power within me, this voice, but I had no idea how to use it or how to find that connection to something I knew I had at one time before. 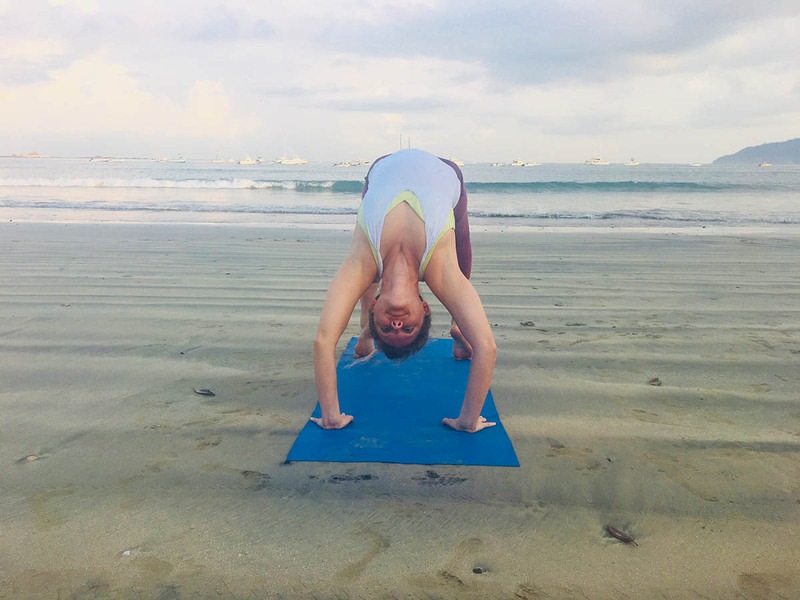 When I began practicing yoga, it helped me to start loving my body more for what it was capable of rather than if it was a perfect shape and size. Through yoga and other spiritual practices, I have been able to cut the cords from my past and release layer after layer of all the fear and trauma so that I can more fully step into the woman I came into this lifetime to be. It is my purpose to help you do the same. Wake your own inner Goddess. Stop waiting for life to happen to you and create the life you’ve always dreamed of. Even if you don’t know what that looks like, you are feeling a calling now to begin on this path and uncover your own power so you too can create change on this planet. The luxury rooms will be given to the first people that register. Those registering after the first ten people will get the more basic, but still very nice, rooms. $500 deposit required to hold your spot. Want to travel with a child or partner? No problem! Contact us today! This training is 100% refundable up to 60 days before the event begins. Yes, I am ready to make my deposit! What does my investment get me? The program is designed to be an 12 day group intensive in a supportive way so nobody gets left behind. Yes! You will get a certificate that you may use to show yoga studios and gyms you have completed a 200 hour yoga teacher training. This program is Yoga Alliance Approved. What if I need to review something? You will have access to videos on each module that you can refer to at any time so you will never feel lost! You can also ask for help or guidance from other students in the private FB group as well as email support in between if needed. I’ve been leading yoga teacher trainings since 2013 and am proud to have certified amazing teachers that are highly skilled in what they do. The skills they have learned set them apart from other 200 hour graduates. As long as you put the work in, you will get much from this program, but it really is up to you. You must commit to not only doing the homework but also practicing yourself and practice teaching others to get the full benefit of the program. There are supplemental reading materials you will need to get the most out of this training. Due to the nature of this program, it is non-refundable.